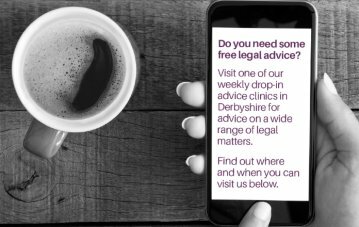 Rothera Sharp Solicitors are offering free legal advice clinics to carers in Derbyshire. Carers can make an appointment to visit one of the weekly advice clinics for help with a wide range of legal matters. Derbyshire Carers Association have worked in partnership with Rothera Sharp Solicitors to set up the clinics to ensure carers have access to quality legal advice. This is in response to carers telling DCA and Derbyshire County Council that they would value someone to speak to face-to-face about legal issues. The clinics are run by solicitor Adam Cotterill and Derbyshire Carers have already received a lot of positive feedback. Adam is very friendly and approachable. He explains legal issues in a clear, straight-forward way that is easy to understand. Over 100 Carers have accessed the clinics since July 2017. Derbyshire Carers and Rothera Sharp plan to offer legal clinics in the rest of Derbyshire in the near future. However, if you live too far away from the clinic venues and you need legal advice, Rothera Sharp can speak to you on the telephone or may be able to arrange a meeting with you in your area. Please get in touch with Derbyshire Carers on tel: 01773 833833 and ask to speak to Helen Weston.